Indranil Karak from Calcutta, B.E. - B.Tech Graduate. P&L MANAGEMENT ENTERPRENEURIAL ATTI.. SALES BUSINESS DEVE.. SUPPLY CHAIN MANAGE.. NEGOTIATION GOVERNANCE & COMPLIA.. STRATEGY AND EXECUTI..
are one of expert skill area's of Indranil Karak . 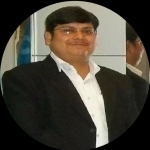 Indranil Karak is working in Materials/Logistics/supply chain management industry.